Bit of pic spam in this post. I bought this badboy at the Professional Beauty Show – Nubar were 3 for £10 which I consider pretty much bargainous. I’m not normally a big glitter fan, as you know, because I completely abhor the removal process (and then having little flecks of glitter stuck to your fingers until about 4 showers later), but I was really drawn to how beautiful this was in the bottle so decided it was worth a shot. A decision I do not regret! Despite looking nice and dense in the bottle, there isn’t much of a base colour to this so it doesn’t work well on it’s own. You’d have to apply about 7 thick coats to get it looking anything like the bottle! 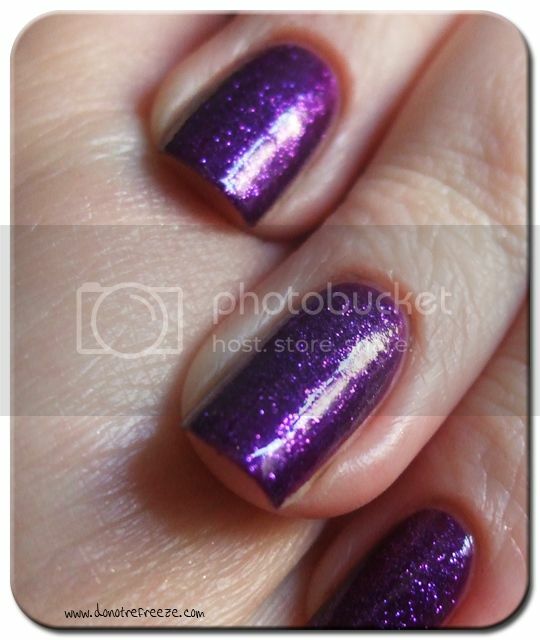 So I layered it over a richly coloured purple shimmer – Models Own Purple Mystique. Two coats of that, and one coat of this. POW! 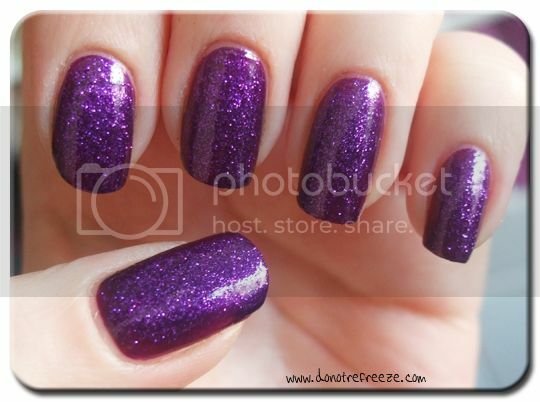 It becomes touch dry very quickly, but the glitter feels a little rough to the touch so I’d suggest a thick topcoat (or two coats of a thinner one) to give you a smooth glassy finish. Now I’ll be quiet and spam you with some photos! These are taken in a variety of lighting – outside in direct sunlight, inside in indirect light and so on. Plus the obligatory blurred shot to show off the glitter! 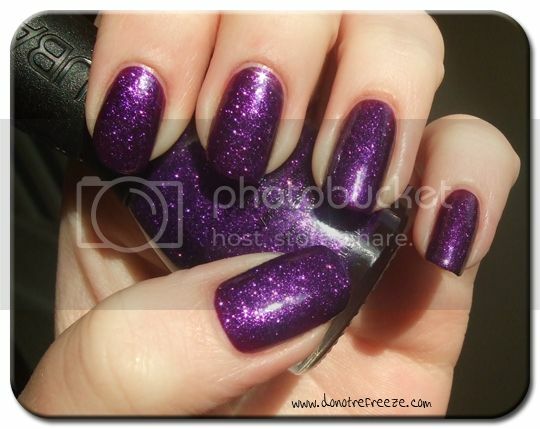 If you like glitter, and you like purple, you NEED this. 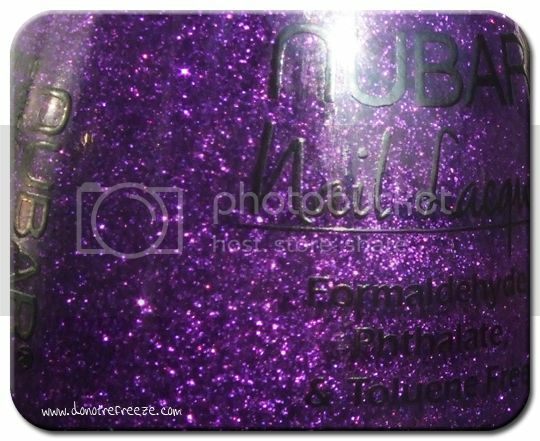 You can get Nubar polishes in the UK from Beautyshed.co.uk, they cost £8 each. i am so freaking jealous! that looks AMAZING on you! So. Darn. PRETTY! 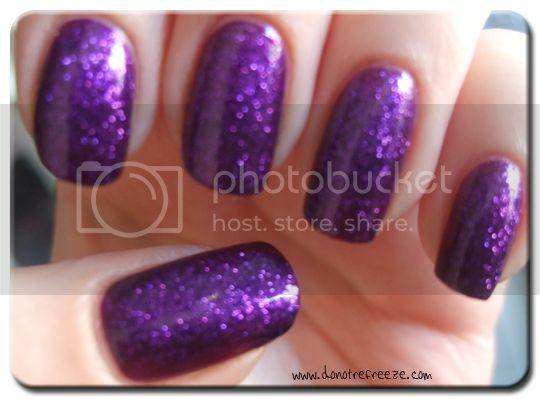 I love all the swatches I see of the ‘flakies’ they have – I wish they were available in a bricks and mortar store. 3 for a tenner. Crikey. I love Nubar with a stonkin’ great love. Oh, this does look really pretty! Love your photos! HOLY MOTHER! <333333333333333 That’s all I can say. I think I have this one. It’s lovely on you! I have it but didn´t try it yet. It´s amazing in the bottle already! This is a stunner! I want! This is frigging gorgeous! I need this in my life asap!